AM Racing has announces the formation of a NASCAR Camping World Truck Series organization. Led by owner Tim Self, AM Racing will field the No. 22 Toyota in the Camping World Truck Series for the full 2016 campaign, kicking off at Daytona International Speedway in February. "This is an extremely interesting and exciting project for us and all of our partners," said Self. "We will be working hard to establish AM Racing as a leader in the NASCAR Truck Series and add an energizing dynamic to the brands of our partners. I have a vision of how I want to build this race program and all of the pieces are coming together pretty quick. We will be well prepared for the season when we show up in Daytona. We are committed to one full time truck already and expect to announce a second one in the near future." AM Racing will field Toyota Tundras in the 2016 season, having partnered with Toyota Racing Development (TRD). The team has also entered into an agreement with Triad Racing Technologies as their engine supplier. Self founded AM Technical Solutions in 1994 to provide Engineering and other Technical Services to advanced technology Industries including Semiconductor and Life Sciences. 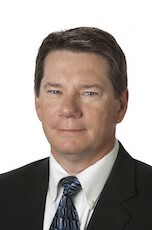 His technology industry experience spans 25 years, and he has extensive expertise in process systems and project management. He has published a number of articles on the design and installation of process systems and has held memberships in the Institute of Environmental Sciences, the International Society of Pharmaceutical Engineers and the American Society of Mechanical Engineers. He has a Bachelor of Science in Mechanical Engineering from Purdue University and owns Central Texas Speedway in Kyle, Texas. "We have developed highly efficient project delivery models from many years of experience and expect to bring effective operational Solutions to the racing industry," he said. AM Racing will be making a driver and sponsor announcements in the near future. The organization is also looking to expand with the second truck for the 2016 NASCAR Camping World Truck Series. Saturday will be a big day for the Kenseth family. When Matt climbs out of the car after final practice for Sunday’s Goody’s Headache Relief Shot 500, he’ll turn his attention to the Kroger 200, where his son Ross will make his debut in the Camping World Truck Series. 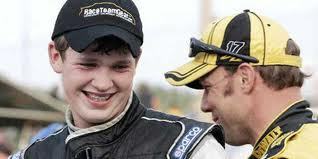 “I’m happy any time someone gives Ross an opportunity to race in NASCAR,” Matt said. “They’re not easy to come by and I know this one came about pretty quickly. He’s been working hard to try to get some more opportunities. “I think he’s performed well in the chances that he’s had, both with JGR in the No. 20 Dollar General car for his first XFINITY start this season, and in the No. 52 ARCA car with (Ken) Schrader." Ross is looking forward to the opportunity, especially because it’s at Martinsville. Naturally, Ross has turned to his father for some advice on how to get around the half-mile track. While his father is a Sprint Cup Series champion, he doesn’t know if he’s the best person for Ross to lean on. In 31 career Martinsville starts, Matt remains winless. “I’m not sure that I’m the guy he wants to get advice from at Martinsville,” Matt said. “We’ve talked about it, but the most important thing for him to do, and I think he knows this, is to run a clean, smart race and try to complete every lap, which isn’t always easy to do there. It’s his first time in a truck and his first time at Martinsville, with a brand new team, so if they had a clean day and got every lap, I think that would be a good debut." Ross was quick to answer if he would rub it in, should he take home the iconic grandfather clock trophy before his father. The Goody’s Headache Relief Shot 500 race weekend starts on Friday with Virginia Lottery Pole Day. The Camping World Truck Series returns for the Kroger 200 on Saturday, with the Goody’s Headache Relief Shot 500 on Sunday. Cale Conley, driver of the #14 TriStar Motorsports NASCAR Xfinity Series Toyota, announced today that he has ended his 2015 race season prematurely, due to a lack of sponsorship and team funding. Conley currently ranks 19th in the NASCAR XFINITY Series championship standings, with a pair of 16th-place finishes at Auto Club and Kentucky Speedways. It was hard to know who to be angry with following a bizarre conclusion to Sunday’s CampingWorld.com 500 at Talladega Superspeedway. 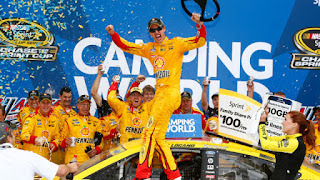 Fans directed their anger – and a few dozen cans of beer -- at winner Joey Logano, after Logano denied Talladega favorite Dale Earnhardt, Jr. an opportunity to advance to the Eliminator Round of the 2015 Chase for the NASCAR Sprint Cup by claiming the checkered flag. A number of drivers expressed unhappiness with colleague Kevin Harvick, who triggered a race-ending, multi-car crash with a questionable lane change that sent Trevor Bayne spinning. Others were angry with NASCAR, after the sanctioning body made a late-race decision to wave off an abortive green-white-checkered flag restart and realign the cars for another try. The wreck-plagued finale came with Logano running mere inches in front of Earnhardt when the caution flag flew for the final time, allowing the Team Penske driver to win his third consecutive Chase victory. It also enabled Harvick to advance in the Chase, despite a balky race car that would almost certainly have doomed him to elimination, had the race run to its planned conclusion. The Budweiser/Jimmy Kohn’s Chevrolet driver ensured that would not happen however, pin-balling off the side of Bayne’s Ford and triggering a multi-car melee that ended the race, with Harvick still in position to advance. Bayne was uncharacteristically outspoken after the crash, saying, “That's a crappy way for Harvick to have to get in the Chase; to wreck somebody -- what I believe to be on purpose (but) maybe it wasn't. The restart before that, he had engine problems and got out of the way. I think he realized if the caution came out, he was going to be fine. So I go by and get hooked in the left-rear. Harvick is a really good driver. I think he knows the limits of his car and where it's at, so that's why I think it was intentional." 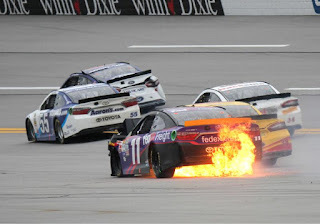 Denny Hamlin and Matt Kenseth – both of whom failed to make the cut to the Eliminator Round – also emptied both barrels on Harvick afterward, accusing him of intention wrecking Bayne, and others. “The 4 knew he was blew up, so he said he was going to stay in his lane,” said an angry Kenseth afterward. “So (Bayne) then went up and outside, and (Harvick) clipped him and caused a wreck because he knew he’d make the Chase that way. Harvick, expectedly, saw it differently. NASCAR Vice Chairman Mike Helton said that after reviewing the incident, he saw no reason to penalize Harvick. That’s not surprising, in the absence of any NASCAR rule outlawing crashes; whether intentional or not. 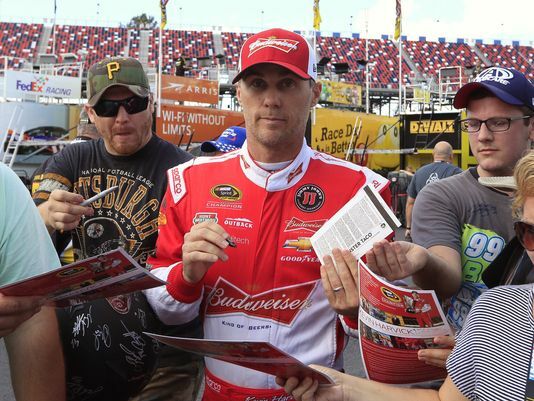 Harvick: Did he, or didn't he? Ironically, Earnhardt’s championship bid was thwarted – in large part – by a revised restart rule that he had championed; an irony not lost on NASCAR’s perennial Most Popular Driver. “Everybody is going to ask me a hundred times how I feel about the green-white-checkered rule now,” Earnhardt said. “I feel good about it. It was a good safe call. The race ended per the rules, and I'm totally OK with that. (NASCAR) decided officially who won the race, and Joey won it. He has had an awesome round. Unbelievable, really. We did everything we could today. Almost perfect, tried really hard. And with four races still remaining until a champion is crowned at Homestead Miami Speedway, there is no indication that things will calm down, anytime soon. JR Motorsports confirmed today that it has entered into a multi-year partnership with BRANDT, a leading agriculture retailer and manufacturer of agricultural specialty products,that will make Justin Allgaier the driver of the No. 7 Chevrolet Camaro, beginning in 2016. Allgaier will vie full-time for a NASCAR Xfinity Series championship with BRANDT Professional Agriculture as a primary partner in 18 of 33 events. BRANDT will receive associate placement in the remaining 15 races. BRANDT’s 2017 races will be announced at a later date. Headquartered in Springfield, Ill., BRANDT has been part of NASCAR since 2011, supporting an “ag car” to build awareness for the men and women of the world’s most vital industry. Joining BRANDT on the car are the National FFA Organization, Nutrients for Life Foundation, Precision Tank, TradeMark Nitrogen, Grigg Brothers and BRANDT iHammer. 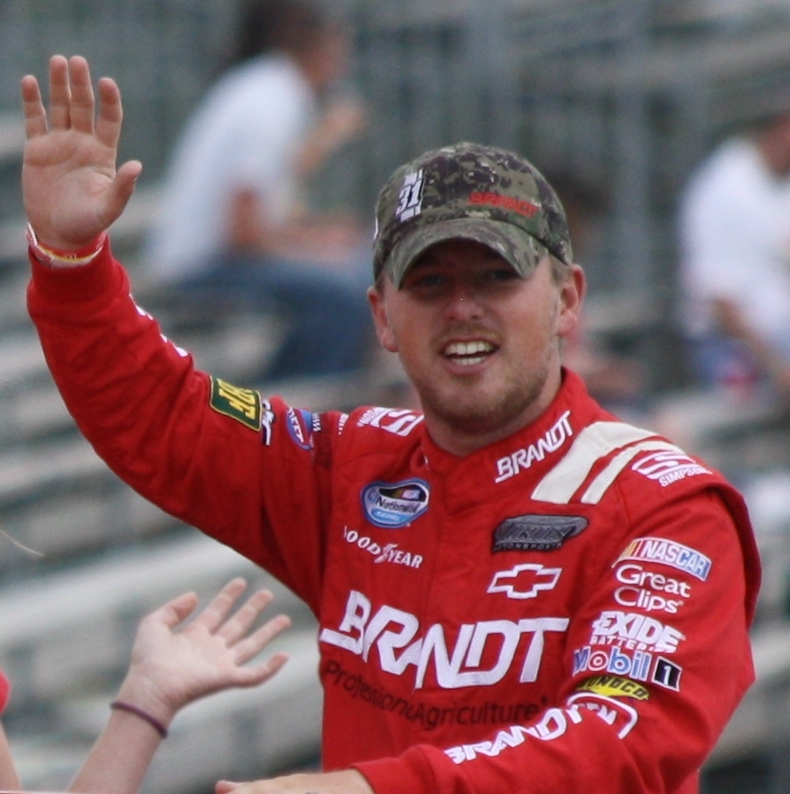 Allgaier has won three times in NXS competition, and two of them came at the wheel of a BRANDT-branded car. In 174 career NXS starts, he has scored 29 Top-5 and 84 Top-10 finishes, and was named the series’ Rookie of the Year in 2009. He finished a career-best third in the NXS championship standings in 2011. Before joining the NXS ranks, he was the 2008 ARCA champion. For the past two years, he has driven in the NASCAR Sprint Cup Series for HScott Motorsports. In addition to BRANDT’s 18 primary races in 2016, the balance of Allgaier’s 33-race NXS schedule will be backed by existing JRM partners including TaxSlayer.com, Breyers, Hellmann’s and Suave. Jason Burdett, current crew chief of the No. 7 team, will serve in the same capacity with Allgaier. Under Burdett’s guidance, the team has earned two wins, 11 Top-5 and 23 Top-10 finishes this season. Allgaier and Elliott Sadler will be JR Motorsports’ two drivers competing for the 2016 NXS championship. It was announced earlier this month that Sadler will drive JRM’s car that is presently occupied by Chase Elliott. JRM’s third team, the No. 88 “All-Star” car, will again race full-time with drivers Dale Earnhardt Jr., Chase Elliott, Kevin Harvick and Kasey Kahne next season. Additional drivers for the No. 88 will be named at a later date. NASCAR today announced agreements with 23 tracks to field NASCAR Sprint Cup Series races for the next five years. Additionally, 24 tracks will host NASCAR XFINITY Series races through 2020. NASCAR also announced its 2016 schedule for both of these national series. The schedule and actual placement of the dates within each given season’s schedule beyond 2016 will be part of the on-going discussions between NASCAR and the tracks. Details are being finalized for the 2016 NASCAR Camping World Truck Series schedule to be announced at a later time. “NASCAR and the tracks take seriously our collective responsibility to the fans and each stakeholder to ensure the sport is healthy, strong and growing, so we can deliver great racing to the fans for many decades to come,” said Steve O’Donnell, NASCAR executive vice president and chief racing development officer. 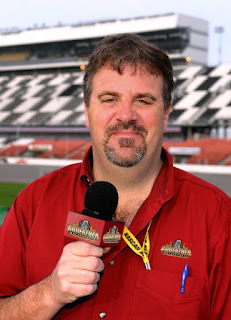 “The live event experience always will be important to creating a lifetime fan in NASCAR. NASCAR will kick off the 2016 season against the new backdrop of a completely reimagined Daytona International Speedway. DAYTONA Rising, the speedway’s $400 million redevelopment project, will be complete when both the NASCAR XFINITY Series and NASCAR Sprint Cup Series launch at Daytona Speedweeks. The 2016 DAYTONA 500 will be held on February 21 and will air live on FOX. After the DAYTONA 500, NASCAR events will be held the following week at Atlanta Motor Speedway. Both series then will travel to Las Vegas Motor Speedway, Phoenix International Raceway and Auto Club Speedway for the return of NASCAR Goes West. Pocono Raceway will host its first NASCAR XFINITY Series event in June, with that series joining the Sprint Cup Series for a companion event at the famed three-turn track. The spring events at Richmond International Raceway move to a Saturday and Sunday companion event for the XFINITY Series and Sprint Cup Series, from the previous Friday and Saturday schedule. The first series stop at Dover International Speedway will move earlier in the schedule, to be held prior to the May events at Charlotte Motor Speedway. NBC will usher in its 2016 race schedule in July at Daytona with the NASCAR Sprint Cup Series event moving back to a Saturday evening event. The August Sprint Cup Series event at Michigan will move to later in the month. 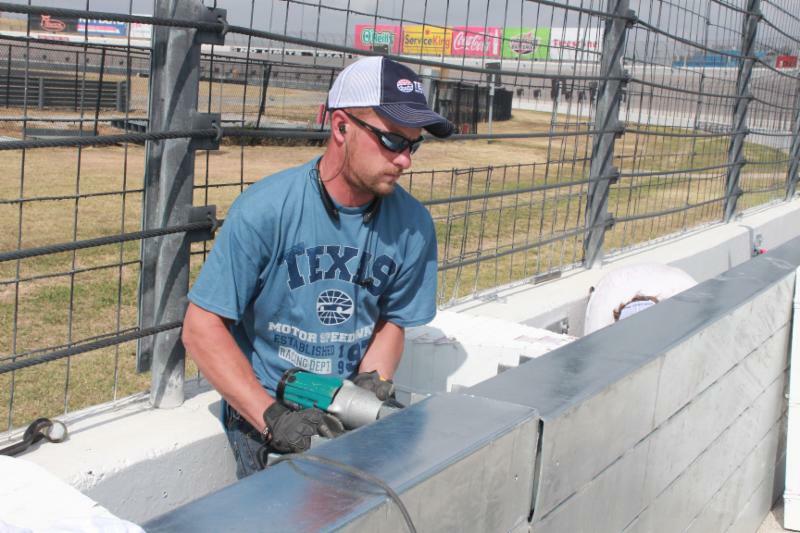 Texas Motor Speedway is near completion of installing 2,866 feet of additional SAFER Barrier on select interior and exterior wall areas of the 1.5-mile oval, in preparation for the AAA Texas 500 NASCAR tripleheader scheduled for Nov. 5-8. This phase is primarily focused on interior walls as well as three exterior sections of the dogleg on the frontstretch. Texas Motor Speedway is adding SAFER Barrier segments on the entire inside wall of the backstretch, inside entry wall in Turn 3 and the interior wall at the entry and exit of pit road. With the existing SAFER Barriers already in place, the entire inside wall of the backstretch from Turn 2 to Turn 3 will have the SAFER walls. On the dogleg, small exterior sections are being installed directly across from the entry and exit of pit lane as well as at the start/finish line. The project is scheduled to be completed by Thursday, which also includes re-painting the various logos on the walls. This addition of SAFER Barrier prior to the AAA Texas 500 race week is the first of three prioritized phases to have the protective wall in place on all the interior and exterior walls of the race track. The second phase, which consists of installation of 2,103 feet of safety barrier, will be completed prior to April's Duck Commander 500 NASCAR doubleheader in 2016. Commonly referred to as a "soft wall," the SAFER Barrier absorbs kinetic energy when a race car makes contact with the wall, which helps prevent injuries to the driver. A team of engineers at the University of Nebraska-Lincoln helped conceptualize the project, which consists of sections of steel tubing backed by foam blocks that are installed 30 inches in front of race tracks' traditional cement walls. The SAFER Barrier debuted in 2002. The upcoming AAA Texas 500 tripleheader weekend features the NASCAR Sprint Cup Series, XFINITY Series and Camping World Truck Series. The NCWTS WinStar World Casino & Resort 350 will be held Friday, Nov. 6, and be followed by the XFS O'Reilly Auto Parts Challenge on Saturday, Nov. 7, and AAA Texas 500 on Sunday, Nov. 8. For ticket information on the entire race weekend, visit www.texasmotorspeedway.com or call the speedway ticket office at (817) 215-8500. HScott Motorsports has announced that it has reached an agreement with Old World Industries to sponsor Clint Bowyer's Chevrolet during the 2016 NASCAR Sprint Cup season with brands PEAK Antifreeze & Motor Oil and BlueDEF Diesel Exhaust Fluid. The OWI brands will be featured as primary sponsor at Watkins Glen International and Chicagoland Speedway, and as an associate sponsor for all remaining races during 2016. Bowyer and PEAK have been in partnership since 2012, a relationship which includes Clint Bowyer Racing's dirt track racing teams. "My bond with PEAK has continued to grow stronger over the years and I am so proud to continue my relationship with them," said Bowyer, who announced Oct. 2 that he will race for HScott Motorsports in a technical alliance with Hendrick Motorsports and Stewart-Haas Racing in 2016. "They have meant a lot to my Sprint Cup program, as well as my dirt teams, and they are like family to me. The best part of a sponsorship is what you do away from the track with customers and building business-to-business relationships and that's why the PEAK program is so special." The PEAK Motor Oil and PEAK Antifreeze & Coolant brands that have adorned Bowyer's cars since 2012 are products in the portfolio of Old World Industries LLC., a company specializing in Automobile and Heavy-Duty vehicle products manufacturing and marketing. BlueDEF is a complete brand of diesel exhaust fluid and equipment, which reduces diesel engine emissions and increases fuel mileage. BlueDEF is the No. 1 DEF brand in the United States. "Our products are endemic to the racing industry," said Bryan Emrich, Chief Marketing Officer of OWI. "The PEAK brand is one of the most recognized in the antifreeze marketplace and the growth of BlueDEF over the past five years has been phenomenal. We think we are aligned with the right personality in Clint Bowyer to speak to our do-it-yourself and Commercial & Industrial customer. We are very happy to continue to grow the brand equity we have built up with Clint over the years and look forward to working with HScott Motorsports in 2016." PEAK Antifreeze has a deep heritage in the world of motorsports, with involvement ranging from NASCAR to NHRA, IndyCar, Supercross, and Monster Jam. PEAK offers a wide array of antifreeze, motor-oil, washer fluid, lighting and other products that feature patented, advanced technologies allowing for superior protection for all vehicles, both on pavement and off-road. PEAK held race entitlements in NASCAR and IndyCar races throughout the 1990s and 2000s, and was an early supporter of NASCAR legends Dale Earnhardt and Kyle Petty. In addition to Clint and a number of other motorsports competitors, PEAK and BlueDEF sponsor 16-time NHRA Funny Car Champion John Force along with the other John Force Racing drivers and a variety of National Champion NHRA Sportsman drivers. "We are thankful to have a partner like PEAK join the HScott family," said Harry Scott, owner of HScott Motorsports. "We are a young organization with just two seasons under our belts, so attracting someone like Clint and a company with such a racing history as PEAK is quite an achievement for us. This is another step in the right direction as we continue to move our program to the next level." 5-hour ENERGY will serve as Bowyer's primary sponsor for 24 races in 2016. Scott said there are still primary sponsorship opportunities open on the car for 2016. Bowyer, 36, is a 10-year veteran with eight victories, two pole positions, 58 top-five finishes and 163 top 10s in Sprint Cup competition. Stewart-Haas Racing announced Sept. 30 that Bowyer will drive SHR's No. 14 Chevrolet in 2017 replacing Tony Stewart who'll retire at the end of the 2016 season. Michael Waltrip Racing, Bowyer's team for the past four seasons, announced in August that it would not field full time Cup teams in 2016.